Reaching Manarola is very easy. Either you exit the highway in Levanto or La Spezia, simply follow the directions to Cinque Terre and then to Manarola. Once you reach the town, you'll find the parking lot : this is the only parking lot in town, altough is pretty big. You can leave your car here at the daily rate of 17 euros. Parking your car here will be safe. 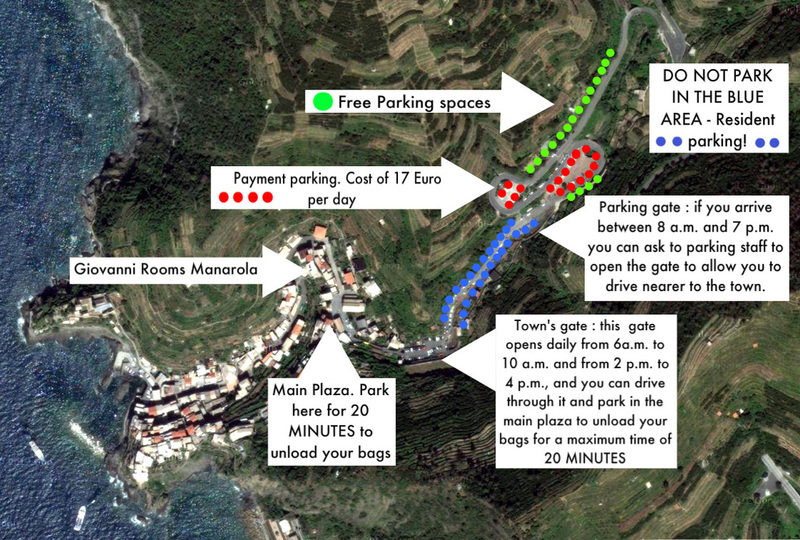 So this is the parking area : as you see, there's a lot of parking spaces, and the red ones (payment) are the most. The daily rate on these spaces is 17 euros per day, and you can pay by cash at the parking gate (see the staff) or by coins at the automatic machine. The green spaces are the free ones : they're located along the road, and in this case it is important to look the signals to put the car in the right place in order to get no tickets. Usually, these free parking spaces get available from late evening until early morning, while they go packed during the day. DO NOT PARK in the blue spaces : these parkings are for resident only (high risk of getting a ticket!). If you have a lot of bags, you can drive your car through the parking lot and reach the town's gate : you will be only at 50 meters from the rooms in this case. You can do this everyday from 8 a.m. to 7 p.m. Reaching the main plaza (5 meters from the room) is also possible MON - SAT from 6 a.m. to 10 a.m. and from 2 p.m. to 4 p.m. : just drive through the town's gate and park your car in the main plaza for 20 minutes maximum to unload your bags, then back up to the parking to park your car.